Simone Biles won four gold medals at last week's world championships -- and is considered nearly unbeatable right now. Last week, 17-year-old Simone Biles won four gold medals at the world championships in Nanning, China, taking home titles in the team, all-around, balance beam and floor finals. She added a silver medal on vault for good measure. If all of those accolades weren't enough, Biles was also named the Sportswoman of the Year by the Women's Sports Foundation shortly after returning from the competition. Not bad for a young woman who has yet to graduate from high school. Here's a quick breakdown on what makes Biles so competitively successful -- and also so darn likable. On floor exercise especially, Biles is unmatched when it comes to height, power and execution. No one does a double-twisting double somersault better. Not even any of the men. All of her floor routines demonstrate her prowess and power, but the camera angle on this one from worlds shows just how high Biles launches herself. She nearly leaves the camera frame on her first two tumbling passes. Perhaps the only female gymnast in the world who can fly higher than Biles -- at least on one skill -- is her U.S. teammate, McKayla "Not Impressed" Maroney. At last year's U.S. Classic (a qualifying meet for U.S. nationals) a fan made a comparison video of the training vaults of Maroney and Biles. While this video emphasizes Maroney's speed -- despite starting farther back on the runway than Biles, she manages to catch up to her at the springboard -- it also shows that Biles, though half a foot shorter than her teammate, nearly keeps pace with her in terms of height and distance from the apparatus. Gymnasts often play around with skills in training that they never intend to bring to competition. Training routines often become, well, routine, and practicing new "dream" skills on the apparatus or into a foam pit keeps things interesting. In this training video posted by her coach, Aimee Boorman, Biles is seen performing one of the most difficult tumbling passes you can do on floor -- that double-twisting double somersault -- off the edge of the balance beam. Yes, you read that right. It is highly unlikely that Biles will ever perform this dismount in competition -- her routines are already chock-full of difficult elements and it would be unwise for her to take that unnecessary risk. But if she did do it, it would surely be named for her. And as Beyoncé sang in "Flawless", every other gymnast on the planet would just have to "bow down." At least year's world championships, Biles debuted a new tumbling skill on her marquee event: a double layout with a half twist. Many gymnasts struggle to get a double layout somersault around to their feet at all. But Biles has miles to go to the floor after she completes her flips -- and sneaks an extra half twist in there before landing. Here she is doing it for the first time at the 2013 worlds, at the 30-second mark. 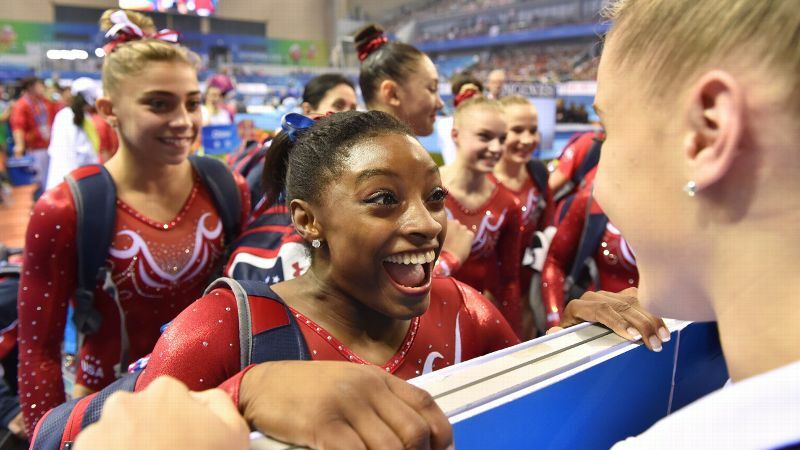 After this performance it officially became the "Biles." On her Instagram, Biles posted a video of herself doing flares on a mushroom -- a training aid used for men's pommel horse. While other women have done flares on beam in the past, it's rare. Seriously, is there anything she can't do? After the U.S. Classic in August (which Biles won handily) she saw Maroney, out with a knee injury, on the sideline. The ensuing tackle from the miniscule, 4-foot-9 Biles is NFL-worthy. Here's a gif of the moment. By now you've probably seen the infamous Simone Biles Bee Video. But we can't not include it -- it's that awesome. What happened: During the women's all-around ceremony at worlds, Romanian all-around silver medalist Larisa Iordache pointed out a bee that had landed on Biles' bouquet. Biles did not just stoically stand there. She threw down her flowers and ran around the all-around podium, leaving both Iordache and bronze medalist Kyla Ross cracking up -- but ultimately escaping the bee. To sum up: She's not afraid of charging toward the vault and flipping into and over it. She is, however, very afraid of bugs. Alas, Simone Biles can't do everything. Shortly after returning from China and winning four gold medals, Biles posted a video of herself trying to perform gymnast Claudia Fragapane's backspin. This video shows a side-by-side comparison of the two -- the British gymnast's easy kick into the smooth spin and Biles' rough one in which she doesn't quite so much spin as land with a thud on her side. Post by Simone Biles Fan.